The Chief Nonsense Officer is writing . . . Become a patron of nonsense on Patreon. My patrons are funding me to (finally) write my nonsense books instead of just talking about them. You too can be a patron and be rewarded with lots of nonsense to read the moment you sign on. 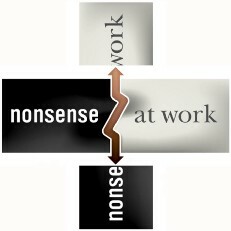 Become a member of NonsenseAtWork on this site, free. Now-and-then I will release members-only nonsense. Follow him on @nonsenseatwork – he tweets occasionally.